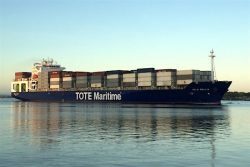 American shipping company, TOTE Maritime Puerto Rico, 2a division of TOTE Inc., has returned very positive reports on its LNG-powered containerships, Isla Bella and Perla del Caribe as they approach the third anniversary of commencing operations. The 3,100-TEU sister ships serve the route between Jacksonville, Florida and San Juan, Puerto Rico and are notable for being propelled by the first ME-GI dual-fuel engines produced by MAN Energy Solutions. “The LNG fueled ME-GI engine represents TOTE’s commitment to environmental stewardship. Importantly, LNG as a fuel eliminates SOx and particulate matter, significantly reduces NOx and –increasingly importantly – contributes to the reduction of green house gases. This gives us the ability to move forward aggressively in terms of air quality which is especially important in the pristine areas of the Caribbean and Florida where our vessels operate”, Nolan continued. “LNG is the fuel of choice for many operators going forward and, in combination with this very reliable dual-fuel technology, provides the quality benefits that we’re all looking for,” Peter Keller, Executive Vice President of TOTE said, noting that TOTE’s decision to adopt the new technology, while risky, has proved justified. In related news, TOTE’s Alaska division., has also contracted MAN PrimeServ – MAN Energy Solutions’ after-sales division – to convert its ‘North Star’ and ‘Midnight Sun’ RoRos to dual-fuel operation on LNG. The vessels are both currently powered by 4 × MAN 58/64 engines and will be retrofitted to MAN 58/64 retrofit units.